Russian bees cluster in the brood box and move up to the food. Russian bees have repeatedly survived Wisconsin winters but understanding Russian bee late season management is essential. The winter colony is small. The smaller 8 frame hives are ideal for the smaller sized winter colony. Food stores are located above the cluster and in the outer frames of the brood super. 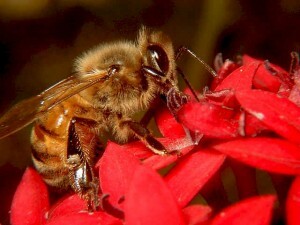 In early winter the cluster is in the brood chamber and as the winter progresses the bees move upward toward the food. If Fall inspections indicate low resources, a feeding board is placed on the hive at the winter solstice. The winter solstice marks the shortest day and longest night of the year. Each days length, thereafter, will gradually get longer until Spring arrives. For further information consult the USDA agricultural resource center. There are enough differences in Russian bee management that the success in the bee yard will be dependent upon well informed management.